When we are new to the world of 12-step meetings, we can feel overwhelmed with pressure and anxiety. We want to fit in. We don’t want to be judged. We want to follow the rules, and also make the most of our time there. Here are some guidelines for meeting etiquette, things to do and things not to do, to help you take advantage of the many benefits that come with attending meetings. Struggling with addiction can cause us to feel totally disheartened. We can feel like we’re climbing an uphill battle with no end in sight. Being new to meetings, we can doubt their usefulness. We can have the misconception that support groups, therapy sessions and meetings are a waste of time, that they are full of people complaining about their problems without making any real headway in their recovery. Being open-minded about the process helps us to open our minds and hearts to positive outcomes. It helps us to rekindle our hopefulness and optimism. Addiction can cause us to close ourselves off and shut other people out. We isolate. We wrongly assume we don’t need anyone else. Be as open-minded about meetings, and the recovery process in general, as you can. You might find the guidance you’ve been searching for. You might meet fellow people in recovery with whom you connect and build lifelong friendships. You might find yourself growing in self-confidence. You might regain your sense of direction and purpose. As with any group, listening attentively and respectfully is paramount to the success of 12-step meetings. When talking about addiction, emotions can run high. We can feel particularly vulnerable, stressed and on edge. We can be inclined to take our feelings out on other people, in what is often misdirected anger or anxiety. Treat every member with dignity and respect. Listen to their stories. You never know when you’ll learn something valuable, become inspired, or be given a chance to connect with someone. Meetings allow us to delve deep into issues that are causing us a lot of difficulty and pain in our lives. As such, we’re inevitably going to share things that are deeply personal and intimate, things that can be very hard to share. Meetings are a safe space where we can feel understood, where other people can relate to our stories and empathize with our struggles. Respect the confidentiality of the group, and keep everything you hear limited to the group’s members. You would never want someone to share personal information about you with someone outside of the group. Respect others enough to keep their information confidential. Public speaking, let alone speaking about such sensitive topics, is one of our greatest and most common fears. We can be filled with anxiety at the mere thought of having to speak in front of other people. We can fear being judged and rejected, misunderstood and shunned. 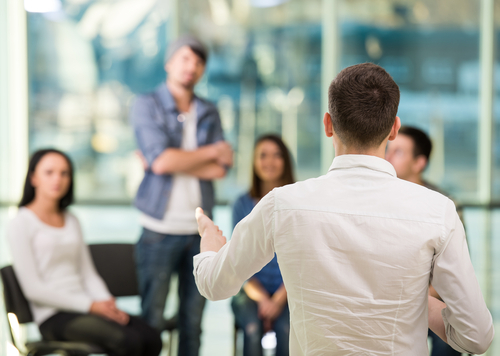 Addiction is an especially challenging subject to speak on, especially if we’re new to attending meetings. Try to push yourself, gently but firmly, to move past the fear. Opening up and sharing of yourself is immensely therapeutic. It’s an important part of the healing process. You also have the unique opportunity to help other people through sharing your lived experience. When fear arises, try not to let it paralyze you. Try to move through it, knowing your recovery is on the other side of your fear. Sharing private information with strangers can be daunting and scary. We can feel totally outside of our comfort zones. This can feel unsafe and troubling. Take your time opening up to the people in your group. There’s no rush, and no timeline. Share if and when you feel comfortable. There is no rule that you must share during a meeting. In fact, many people feel supported, helped and understood just by listening to other people share. Don’t feel obligated to talk. Meetings are for your benefit, so use them in whatever way you feel most comfortable. Don’t feel pressured or pushed to share unless you want to. Sometimes we’re so overwhelmed with the issues in our lives that we’re tempted to use meetings as our own personal therapy sessions. We start talking about all kinds of issues with our families and relationships, our difficult circumstances, that decision we’re deliberating about. Meetings are intended to be a time when we can commit to talking about the hard issues surrounding our addictions, with other people going through similar issues, who can personally relate. To help yourself and fellow meeting-goers make the most of your time, keep your shares limited to addiction-related subjects. When we don’t commit to staying on-topic, we can find the group shares going in multiple, irrelevant directions, causing people to feel as though their time and energy are not being maximized. When we’re excited or feel compelled to speak, we can be tempted to have side conversations with our neighbor while someone is sharing. This can be disruptive and distracting. It can cause whoever is speaking to feel disrespected and unappreciated. It can make them less inclined to want to share again, especially if speaking was difficult for them to begin with. We want everyone to feel welcome, heard and respected. Having side conversations can cause us to be perceived as rude and unkind, even when we don’t intend to be. It goes against the culture of supportiveness and inclusiveness that 12-step meetings are working to foster. Joining a 12-step community is highly beneficial to our recovery and is an important part of the healing work we do. With the many benefits also come responsibilities. By following meeting etiquette, you can enable yourself and the people you’re in community with to make the most out of your time together. At Hired Power, we know firsthand what it takes to stay sober and maintain recovery. We can help you achieve lasting sobriety and find the freedom that comes with recovery. Call us today: (714) 559-3919.